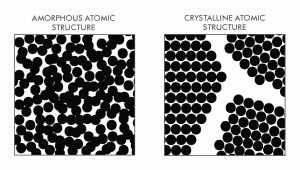 Metals and alloys are generally considered crystalline, which means that their constituent atoms are arranged in a regular, periodic, granular manner. 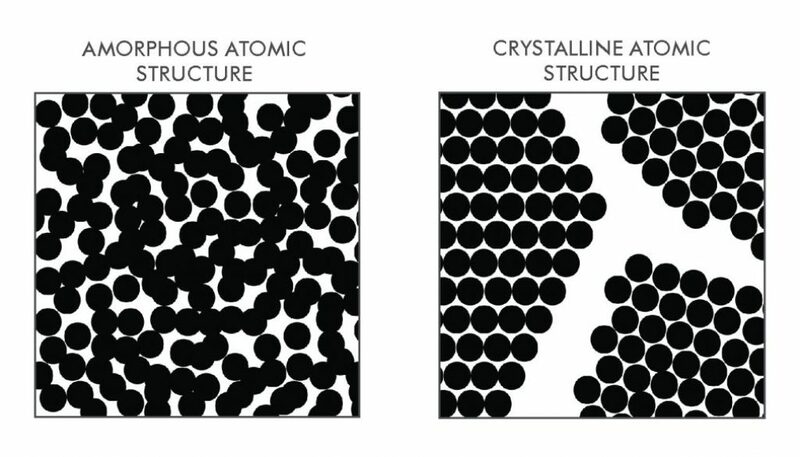 Granted, some have extremely complex crystal structures, but they are nevertheless regular and structured. Solids which do not exhibit periodicity — that is, which do not exhibit any regular arrangement of their constituent atoms, and which are fundamentally unstructured — are considered “noncrystalline,” “amorphous,” or “glassy.” Broadly speaking, the arrangement of atoms in an amorphous metal is no different from that disordered or chaotic arrangement of atoms observed in an oxide or silicate glass. And, like these ubiquitous glasses, amorphous metals can generally only be prepared via rapid solidification from a melt — which, particularly for metals as opposed to oxide glasses, involves extremely high cooling rates. 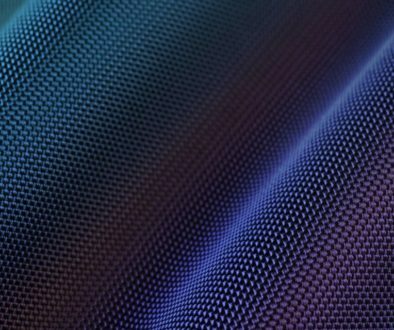 The non-crystalline atomic structure of amorphous alloys lends them unique properties; they are a novel class of material, not quite an “alloy,” not quite a glass, and certainly not a ceramic — but with traits that borrow from all of the above. Broadly speaking, their strength and hardness are greatly superior to crystalline metal alloys, their ductility is reduced, their resistance to abrasion and wear is far higher, their resistance to corrosion is higher. Their impact resistance and toughness vary, with some compositions behaving much like ceramics and glasses, whereas others are as tough as maraging steel. Generally speaking, they tend towards brittleness, as their atomic structure prevents them from arresting growing cracks. 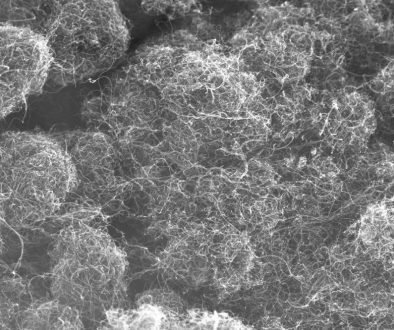 Work-hardening is impossible in amorphous alloys, and heat-treatment can turn an amorphous alloy into an inferior crystalline one — so, once made, amorphous alloys are not thermally or mechanically treated. Amorphous alloys are generally complex from a chemical and metallurgical standpoint. 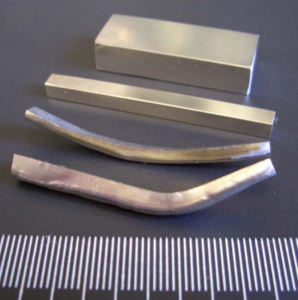 One of the most popular commercially-available amorphous alloys, known as Vitreloy 105, has the following composition: Zr52.5Ti5Cu17.9Ni14.6Al10 (In other words: Zr: 52.5% Ti: 5% Cu: 17.9% Ni: 14.6% Al:10%.) It is therefore characterized as a zirconium-based amorphous alloy, as zirconium is the primary element of its composition. Vitreloy’s complexity is typical of commercial bulk amorphous alloys. But they’re not all complex; the simple ferroboron alloy Fe80B20 can be amorphous, and the first discovered amorphous alloy was a similarly simple Au-Si alloy. As these examples demonstrate, the least complex amorphous alloys are generally comprised of a transition metal alloyed with a metalloid. Although many amorphous alloys are softer and more brittle than tool steel, certain bulk amorphous alloys — particularly those based upon a foundation of nickel, tantalum, or iridium — have displayed incredible hardness values of 1200 to 2000 HV, which means that the very softest of these amorphous alloys is nearly twice as hard as the best ultra-high-hardness armor steel, and the hardest is significantly harder than armor ceramics such as alumina and reaction bonded boron carbide! What’s more, these amorphous alloys display reasonably good elasticity, stiffness, damage tolerance, and compressive strength. Alloys based upon lightweight scandium, in particular, display outstanding elastic properties combined with good hardness and low density. 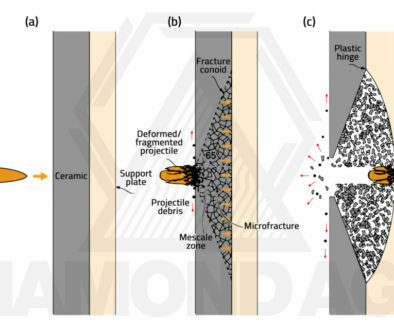 The mechanical properties of these aforementioned amorphous alloys, taken together, strongly indicate that they should be capable of defeating armor piercing rounds in thin sections, and may be even more durable and damage-resistant than armor steel. It is worth noting here that the high-performance glassy alloys mentioned above were not optimized for use as light armor materials. Thus it should almost go without saying that a modern research program could identify and develop better materials; the best light amorphous alloys for armor use; characterized by low density and reasonable materials costs in addition to extremely high hardness, good elasticity, and so forth. It is highly plausible that thin sections of these hard amorphous alloys would out-perform both steel and ceramics as an armor material. Preliminary work has already done much to confirm this assumption. If there are hurdles, they’re in the development and bulk production of these unusual metallic glasses. The production methods used for steel and other metals are, in general, wholly inappropriate for amorphous alloy production. Presently-available commercial amorphous alloys like Vitreloy are completely inappropriate for use in armor systems, for reasons which go beyond the fact that they were never optimized for use in armor. Diamond Age is actively researching bulk metallic glasses and amorphous alloys for armor applications, and is working to overcome the issues associated with their production on commercial scales. We anticipate that our light armor amorphous alloy shall find its way into commercial armor products within the next few years. What’s more, we believe that there’s a sizable market for ultra-high-performance bulk metallic glasses in aerospace, optical devices, and jewelry.